I had seen images of this iconic site but nothing prepared me for the actual view of the Grand Prismatic Spring in the Midway Geyser Basin in Yellowstone National Park, Wyoming. We got up early in the morning to make it to this location when the sun was still low in the sky. Looking at the Excelsior Geyser from the boardwalk around Grand Prismatic. 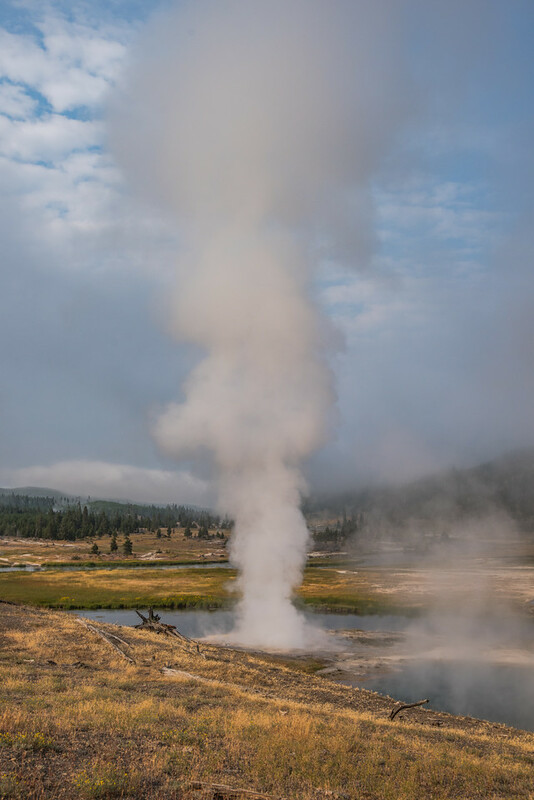 When we arrived there was a heavy fog along with steam from the geyser pools. The surface of the ground is very fragile so there are extensive boardwalks that go around the springs and geysers. We walked around the boardwalk to see the different surfaces. 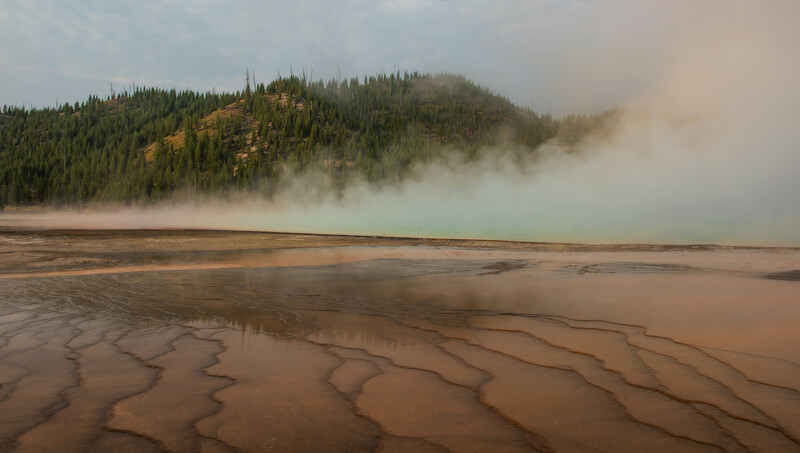 As the fog started rising, the colors of Grand Prismatic started to come through. 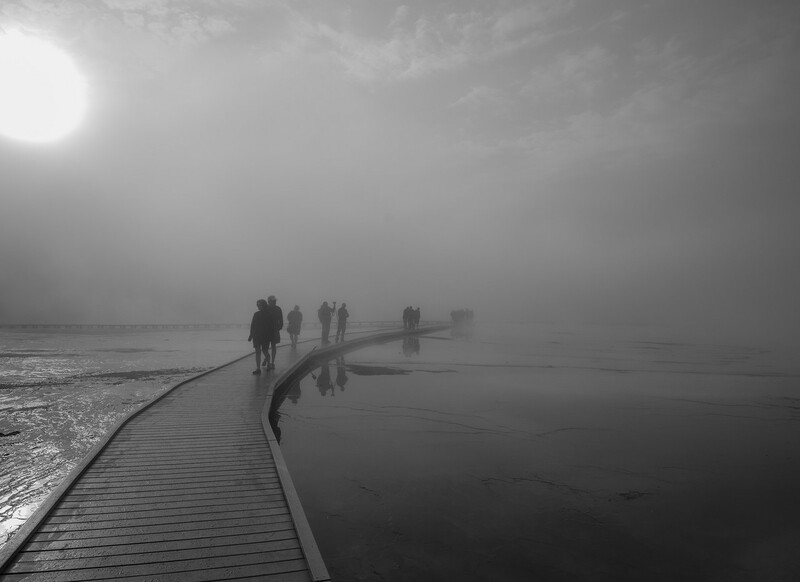 Grand Prismatic in the fog! Grand Prismatic Spring was noted by geologists working in the Hayden Geological Survey of 1871, and named by them for its striking coloration. Its colors match the rainbow dispersion of white light by an optical prism: red, orange, yellow, green, and blue. The first records of the spring are from early European explorers and surveyors. In 1839, a group of fur trappers from the American Fur Company crossed the Midway Geyser Basin and made note of a “boiling lake”, most likely the Grand Prismatic Spring, with a diameter of 300 feet (90 m). In 1870 the Washburn–Langford–Doane Expedition visited the spring, noting a 50-foot (15 m) geyser nearby (later named Excelsior). The vivid colors in the spring are the result of microbial mats around the edges of the mineral-rich water. 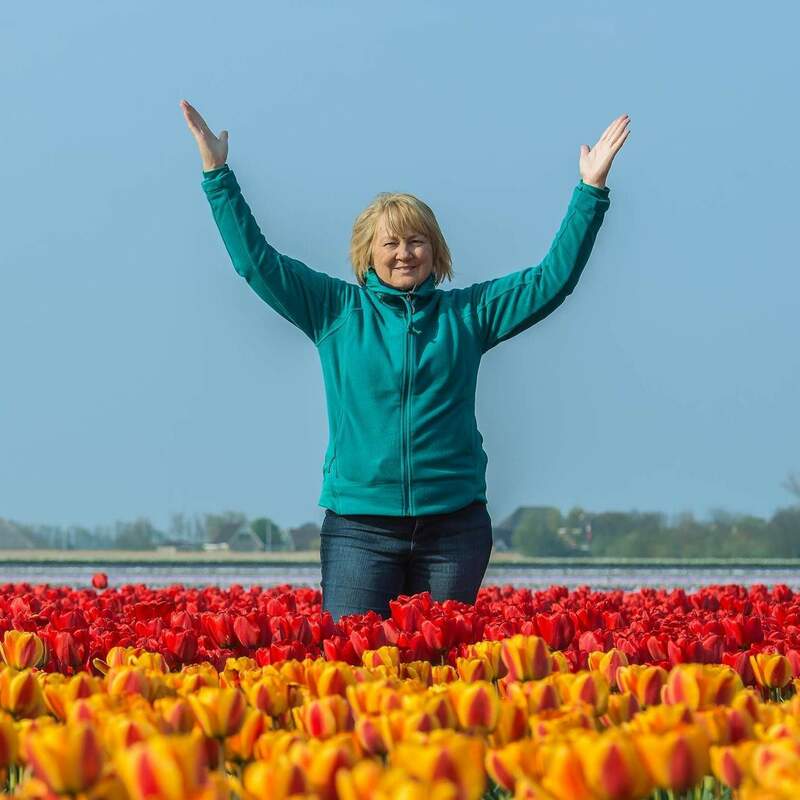 The mats produce colors ranging from green to red; the amount of color in the microbial mats depends on the ratio of chlorophyll to carotenoids and on the temperature gradient in the runoff. In the summer, the mats tend to be orange and red, whereas in the winter the mats are usually dark green. The center of the pool is sterile due to extreme heat. The deep blue color of the water in the center of the pool results from the scattering of blue light by particles suspended in the water. 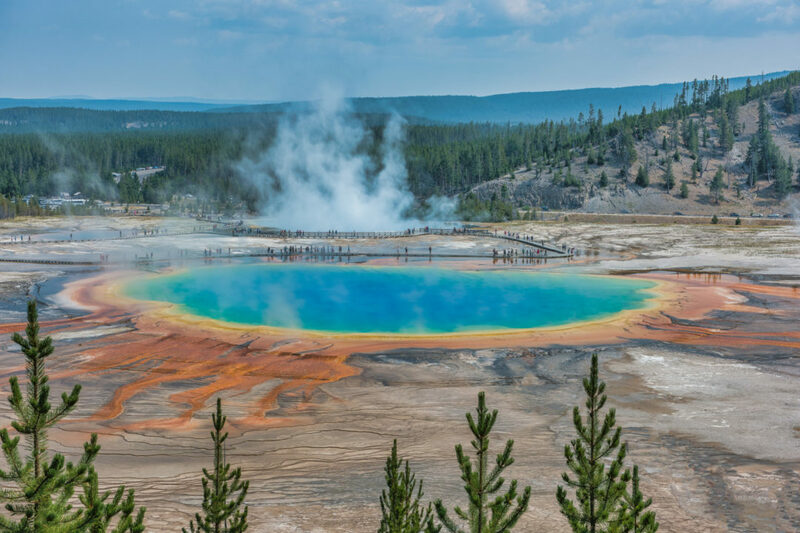 This effect is particularly visible in the center of the spring due to the lack of archaea that live in the center and to the depth of the water. The spring is approximately 370 feet (110 m) in diameter and is 160 feet (50 m) deep. The spring discharges an estimated 560 US gallons (2,100 L) of 160 °F (70 °C) water per minute. Hot Springs & wildflowers at the base of the Angel Falls trail. Later in the day we came back to the Midway Geyser Basin area to Angel Falls. We took the trail up the mountain and then the fork in the trail that goes up to the overlook above the Grand Prismatic! The climb up to the overlook is fairly long but doable if you take your time. The view from the overlook was spectacular. 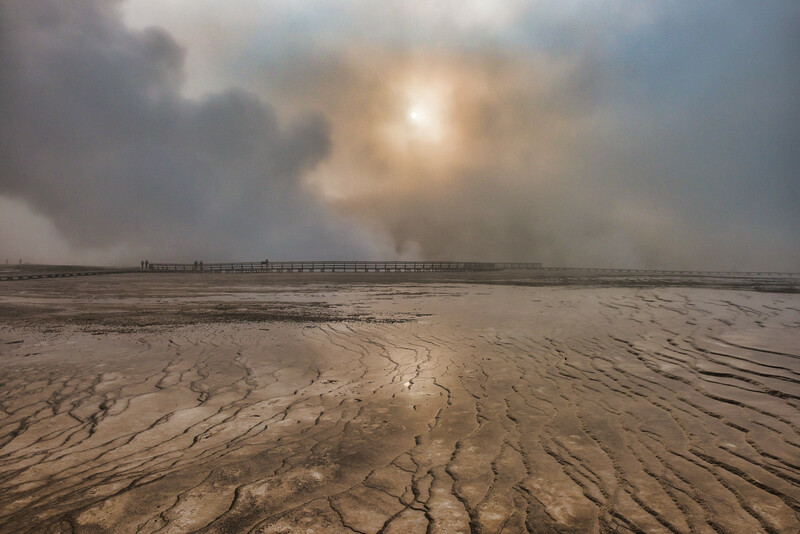 As the day had warmed up the steam was now minimal coming off the the Grand Prismatic. The Excelsior Geyser in the background was still steaming a lot, though. There were many people coming and going at the overlook. I had to put down my tripod and could not really move it as everyone wanted a selfie with this beautiful & colorful site in the image. Grand Prismatic Springs from overlook on Angel Falls Trail. As an added bonus, we noticed a geyser going off that was close to a parking lot as we were leaving the basin. The Flood Geyser was not as big as Old Faithful but it was really cool to catch one going off! 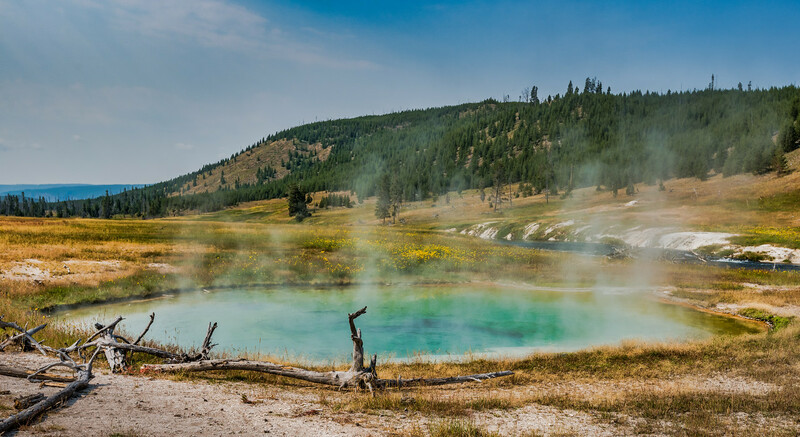 Be sure to check out Grand Prismatic Spring and the Midway Geyser Basin. And get that awesome view from above as that is the money shot for this location! 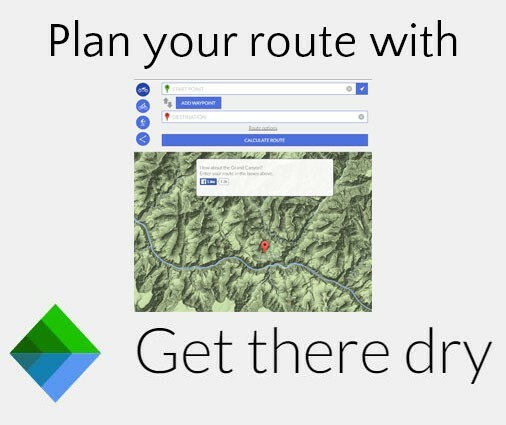 For more information on this part of Yellowstone check our their website. Please visit my gallery for these and additional images!